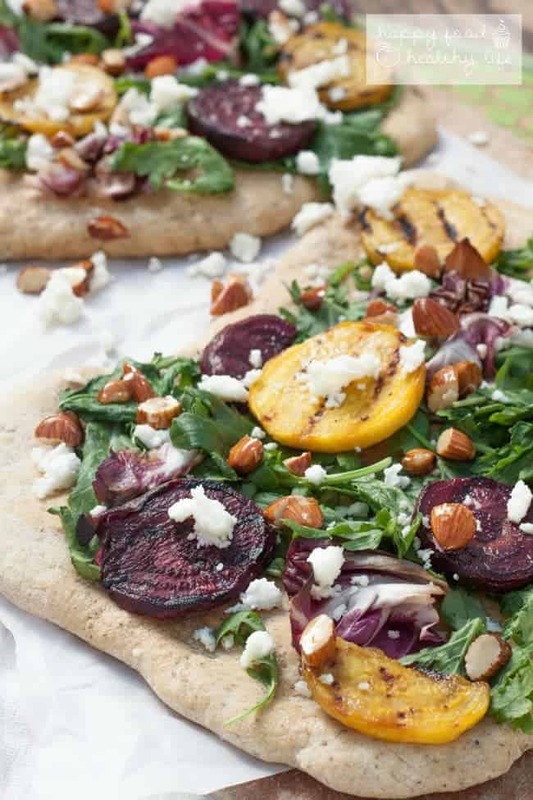 Freshness on top of a whole wheat flatbread is 100% where it’s at this summer. 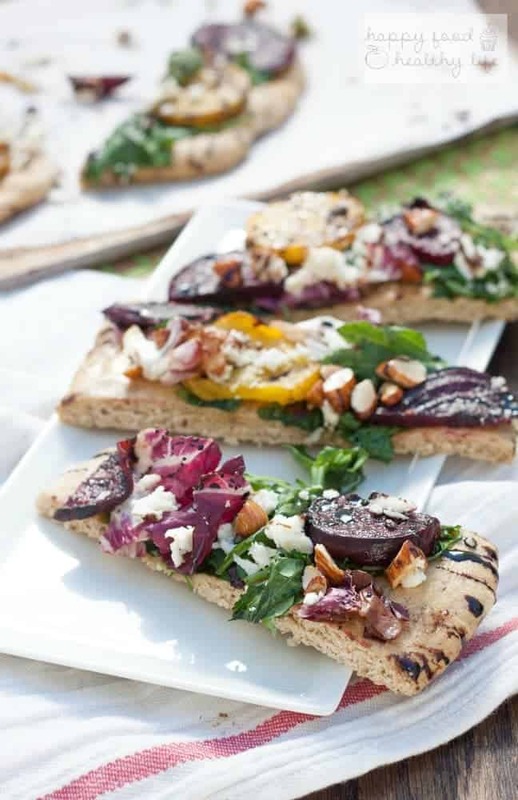 Get into it with this Grilled Beet Flatbread Salad. Oh my goodness, there is so much excitement over this recipe that I can’t really contain myself. The vibrant colors. The cheese. The homemade flatbread. The balsamic. The candied almonds that are totally not bad for you at all. And the KALE! 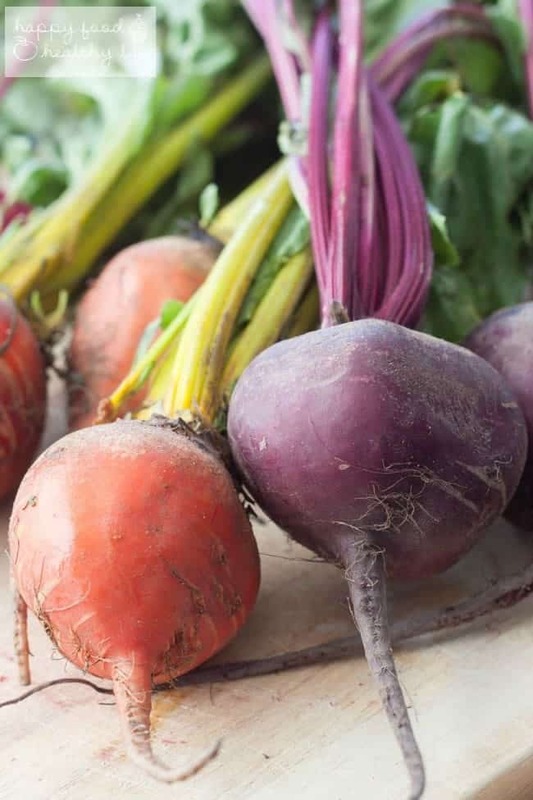 I have been eating this in traditional salad form all summer long so far. I’ve talked about it on Periscope. I’ve Instagrammed it. And I’ve definitely been nomming on it. But here’s the thing. I got really really sick of salads. I love salads a lot, but dang, sometimes I just want to switch it up a bit. So this time I did. I was so excited to try the new Kale Italia from Earthbound Farm and turn my salad into something over the top. What I love most about this kale is that it’s so much more mild than the big stalks of kale I normally get at the farmer’s market. And with inspiration from the Mediterranean, the baby kale is combined with baby arugula, mizuna (totally new to me! ), and radicchio. Lots of crunch. Lots of mild, sweet, and nutty flavor. I knew this would be a perfect addition to amp up that salad. And there are so many other things I could have done with Earthbound Farm’s amazing organic Kale Italia blend. I could have mixed it into a pasta. I could have sauted it with lentils. I had options and will be exploring them all soon. But I had my eyes set on this gem! 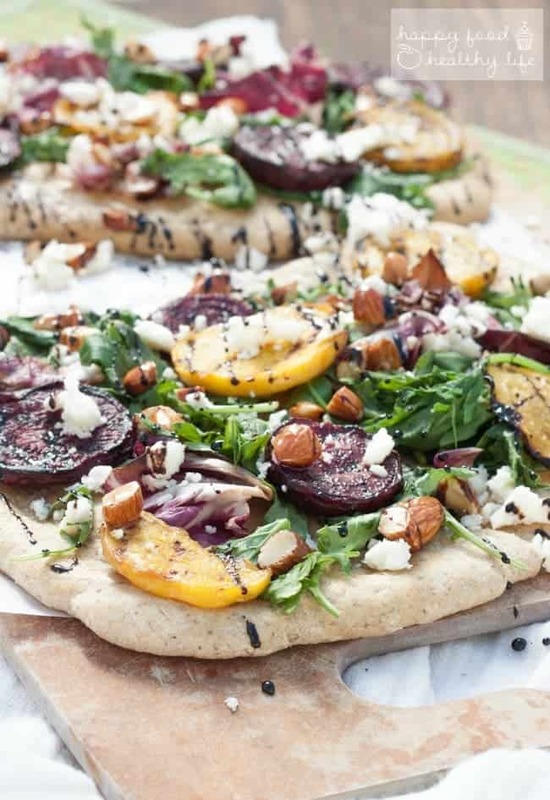 And the great thing about this flatbread is that it’s so versatile. 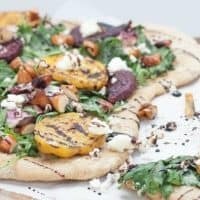 Of course, you can make a whole meal of it and enjoy about half a flatbread for yourself. 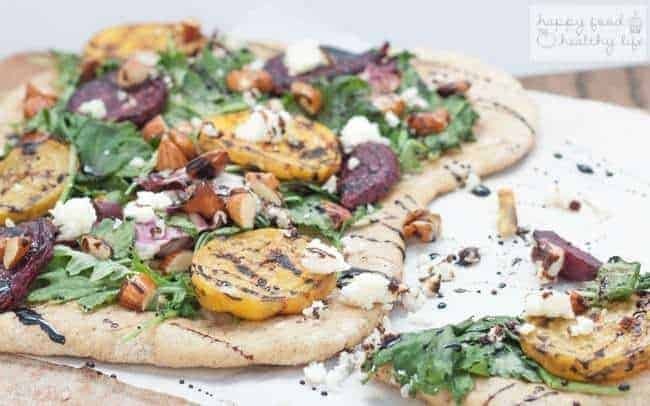 OR (and I’m really a fan of this idea), invite a few friends over, pop a bottle of crisp wine to accompany the summer air, and slice this baby up to share. A couple glasses of wine, lots of laughter, music, and good fresh food. That’s where it’s at this summer! Freshness on top of a whole wheat flatbread is 100% where it’s at! I hope you don’t get intimidated by the multiple steps in this recipe. 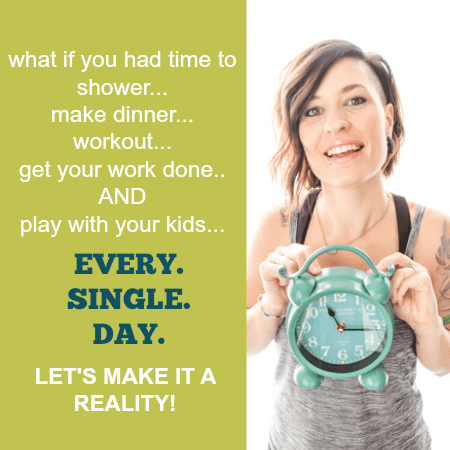 They’re all easy and they can all be done while other steps are being done. You got this girl! 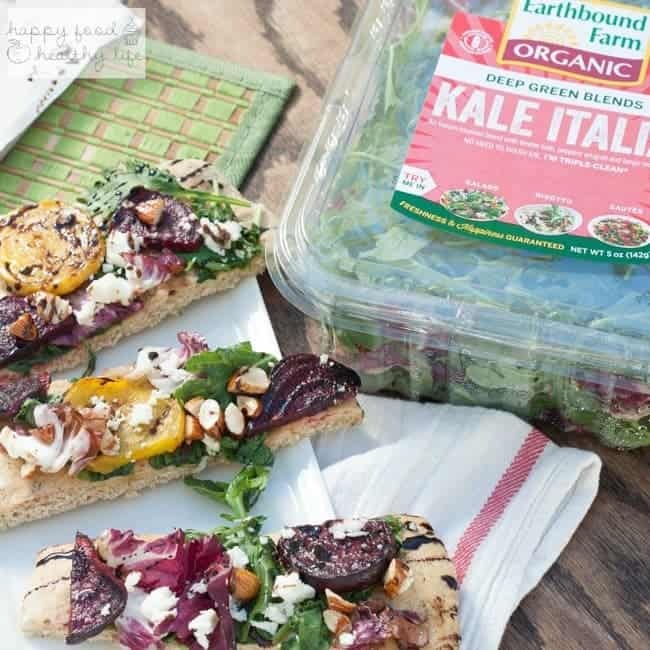 Make sure you grab your own container of Kale Italia from Earthbound Farm next time you stop at the store. Hey, I’ve even got a coupon for you that you can grab right here! Looking for more healthy appetizers and salads? This looks delicious. I fell in love with flatbread at Subway, of all places, but I’ve since found much better places to get it. I love that this includes candied almonds, too. Candied nuts are delicious. I think this is a great healthy recipe to try. oh I LOVE flatbread! And you can find it whole wheat now too, which is a plus. The candied almonds in this recipe add such a delicious crunch and area great to use on salads too!